Is the End of Unlimited Broadband Coming Soon? Two ISPs have already begun a slow, clever plan to eventually make big money from overage charges. Until you might actually need it, your Internet service provider (ISP) happily gave you all the data you could consume. Until the rise of streaming video, the only people eating up tons of data were high-end gamers and maybe people stealing movies. It simply wasn’t possible to be a data hog for the average person watching cat videos, checking sports scores, and/or visiting social media websites. Because of that — much like wireless providers were more receptive to unlimited plans when the mobile web was a barren wasteland of repurposed sites and little else — broadband providers never bothered to cap their plans. Consumers got “unlimited” service only because the vast majority of us barely moved the needle. It wasn’t generosity. It’s already started with Comcast (NASDAQ:CMCSA) and AT&T (NYSE:T) enforcing data caps with customers and it’s going to get worse. UNLIMITED BROADBAND DATA MAY ULTIMATELY BECOME A THING OF THE PAST. IMAGE SOURCE: AUTHOR. How are Comcast and AT&T using data caps? In both cases, the two ISPs have not set data caps in order to make more money today. Instead, they have cleverly laid the groundwork to collect them down the road. The two broadband providers have set relatively high caps — 1 TB across the board for Comcast and the same for many AT&T users — and they are not quick to add charges, giving consumers multiple months over the cap before charging them. At 1TB, or even at half that number, few people are likely to go over the cap today. Going forward however, as streaming video grows, gets joined by virtual reality, and Internet of Things devices all eating data, then what seems like a huge number today may not be so big going forward. As data needs grow, consumers will use more, and going over may become the norm. When that happens, Comcast and AT&T won’t be adding new charges, they will simply be collecting ones that had been in place for years. Why will unlimited broadband go away? It all boils down to two things. The first is that all the major ISPs also operate as cable providers and if a customer cuts the cord they lose revenue. Adding data caps makes it possible to recoup lost pay-television revenue and even dissuade people from leaving cable. If it’s cheaper to stay and pay overage fees due to increased streaming, then why cut the cord at all? The second reason, however, may be the more important one. Comcast, AT&T, and any other ISPs see how much overages have made the wireless carriers. First it was through people exceeding their allotted calling minutes and now it has moved to money made from people either exceeding their data cap or buying bigger data plans than they actually need in hopes of avoiding overage charges. T-Mobile (NASDAQ:TMUS) CEO John Legere, a crusader against overage charges, peggedthe total current annual total at $2.5 billion, but noted at a November 2015 Uncarrier X eventthat the number might be closer to $45 billion a year when you factor in over-buying. In the same way that T-Mobile has made not charging overage charges part of its business model (it instead slows data speeds when consumers reach their limit), there will be ISPs that continue to offer unlimited broadband. Charter Communications, the second biggest provider behind Comcast, can’t implement a cap for seven years under the deal it made to win Federal Communications Commission (FCC) approval of its deal to buy Time Warner Cable. But while it might not happen quickly and it won’t be universal, data caps and overage charges are coming because ISPs see how much money the wireless carriers make from a confused public. People accept the idea that if they consume more data they should pay for it and people have shown with their phones that they are either unwilling or unable to keep track. Comcast and AT&T are building up the expectation that using more data means paying more money. That will lead to people paying for unlimited plans when they don’t need them or running up overage charges when they do. The profit potential for ISPs is simply too high to let unlimited broadband live and it’s slow death has already begun. Writing in the journal Acta Astronautica, scientists at the Search for Extra Terrestrial Intelligence (SETI) institute describe a protocol for how to break it to the world that we’re not alone in the Universe – without causing global mayhem. Rather than a conspiracy of government cover-ups so beloved of sci-fi writes, the study strongly recommends openness as the key to having a “sane global conversation” about the discovery of ET. Now, Duncan Forgan and Alexander Scholz, from the University of St Andrew’s in Scotland, have prepared an updated protocol for how scientists should navigate the “unprecedented media onslaught”. Then if a signal is detected, the discoverers should not to try to keep it under wraps – the potential fall-out from a leak would be too damaging. Much better to announce a tentative detection, but be clear that it must be assumed to be of natural or manmade origin until proved otherwise. In the case of the detection is confirmed, however, the SETI scientists should become deeply involved in the global conversation by engaging across as many social media platforms as possible – a role they would likely assume for the rest of their lives. They should also be prepared for the downsides of newfound fame – such as cyber attacks. The latest polls (conducted in Germany, the UK and US last September) show that most people in developed countries believe intelligent aliens exist somewhere in the Universe. But that doesn’t mean we’re ready for a “first contact” event. However unlikely such a discovery is, a signal from an alien intelligence would be the most momentous discovery the human species is ever likely to make. It’s worth a little thinking ahead. This article was originally published on May 27, 2015. Now that pot legislation is making its way across the country, it’s time for a refresher on the difference between the main types of marijuana strains: indica and sativa. It’s a lesson some of us have had to learn over and over again. But, this infographic from the recently-released Green: A Field Guide To Marijuana will help us get it right. 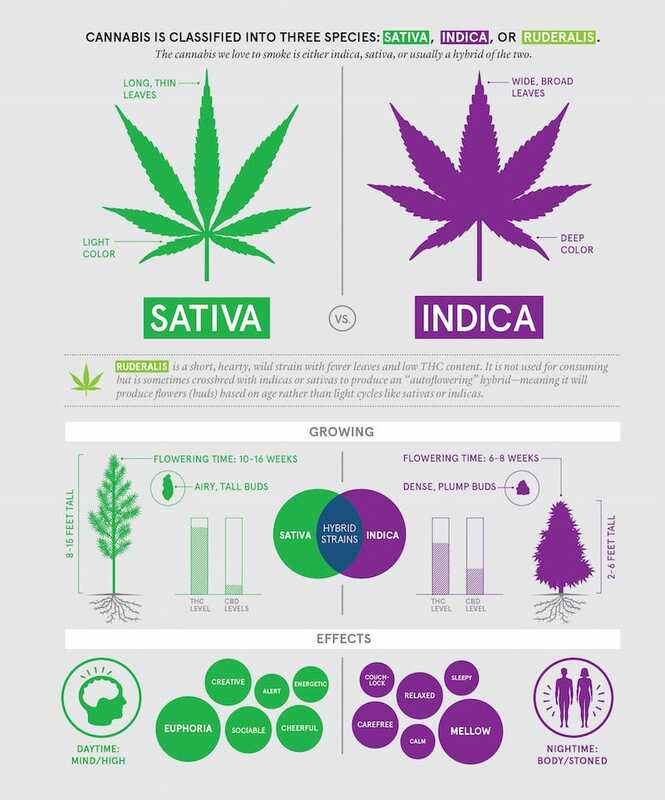 But, as the infographic shows, the differences start with the shape of the plants: Sativas tend to have longer, thinner leaves and are lighter in color. Indica strains, meanwhile, often have shorter, fatter leaves and dark, dense buds. And then, of course, there’s a whole host of hybrid strains that may produce a high that’s between the two ends of that spectrum. But, when they’re up-close — like in Erik Christiansen’s photos in the book — the differences are easy to spot. Check out the full infographic, below. IMAGE: COURTESY OF GREEN: A FIELD GUIDE TO MARIJUANA BY DAN MICHAELS, PHOTOS BY ERIK CHRISTIANSEN, PUBLISHED BY CHRONICLE BOOKS. PHOTO: COURTESY OF ERIK CHRISTIANSEN. Oceanographers may need to study alien worlds sooner than you think. Observations by NASA‘s Cassini spacecraft indicate Saturn’s moon Titan is more Earth-like with its dense atmosphere, lake-filled surface and possible wetlands. Other than our home planet Titan is the only known world in the solar system with stable liquid on its surface, according to NASA. A near-infrared, color mosaic taken by NASA’s Cassini spacecraft shows the sun glinting off of Titan’s north polar seas. The view was acquired during Cassini’s August 21, 2014, flyby of Titan. A new study using Cassini’s radar instrument to study Titan’s second largest sea, known as Ligeia Mare, between 2007 and 2015 reveals it’s a filled with methane. The study published in the Journal of Geophysical Research: Planets confirms what planetary scientists have thought about Titan’s seas for some time. Using Cassini’s radar instrument to detect echoes from the seafloor of Ligeia Mare scientists used the depth-sounding information to observe temperatures, which helped give clues to their composition, according to the news release. “Before Cassini, we expected to find that Ligeia Mare would be mostly made up of ethane, which is produced in abundance in the atmosphere when sunlight breaks methane molecules apart. Instead, this sea is predominantly made of pure methane,” said Alice Le Gall, a Cassini radar team member and lead author of the new study. Ligeia Mare, shown here in a false-color image from NASA’s Cassini mission, is the second largest known body of liquid on Saturn’s moon Titan. The image is a false-color mosaic of synthetic aperture radar images obtained by the Cassini spacecraft between February 2006 and April 2007. Ligeia Mare is the about the size of Lake Huron and Lake Michigan together, according to NASA and from Cassini’s flybys scientists were able to determine the sea is 525 feet deep in some areas. All of Titan’s seas are named for mythical sea creatures. The largest sea, Kraken Mare is about 680 miles long. Another similarity between our home planet and Titan is they both have nitrogen atmospheres, but Titan is lacking much oxygen. Titan’s atmosphere is mostly methane with trace amounts of ethane and because of the distance from the sun, meaning cold temperatures, the methane and ethane remain in liquid form instead of escaping, according to NASA. Le Gall offered a few possibilities of how Ligeria Mare became mostly methane filled, instead of ethane as Cassini’s team originally thought. The study also found Ligeia Mare’s shoreline may warm quicker than in the sea, similar to a beach on Earth. Images captured of Saturn and its moons by the Cassini spacecraft. The Cassini mission is a joint project managed by NASA, ESA and the Italian Space Agency.